I was applying for an Ireland tourist visa. One of the questions asks whether I have been refused a visa for any country and, if yes, details of the refusal must be given. It further states that concealment of visa refusals will result in refusal of an Irish visa application. I was denied a US F-2 visa. However, there is NO stamp or indication of the visa refusal on my passport. Are there agreements between the two nations to share such information? You may remember as part of the F2 application process an attendant asked you to place your hand over a something like a miniature photocopier? And then the other hand? That made and recorded an electronic scan of your fingerprints. The scan was digitised and put on to a database. Part of the rationale for doing that was to match up any future visa applications you make so that all your stuff is linked to a single record that you can't tamper with. This so-called 'biometric enrolment' became fashionable in the early 2000's to help combat people who lied about their immigration history. Incredible to relate there are people out there who entertain such notions. How could the Irish embassy and/or immigration officers know about my visa application history with the United States? When you apply for a visa to Ireland, part of the process is... you guessed it... biometric enrolment! Once captured, the digitised biometrics are stored on a computer and the visa officers can run them through a matching program to see if you show up anywhere else in the system. What this means is that the person's passport is relegated to a somewhat secondary level in finding out exactly who the applicant is. If they find a match on the person's biometrics they will get to learn if the applicant is an honest person or not. 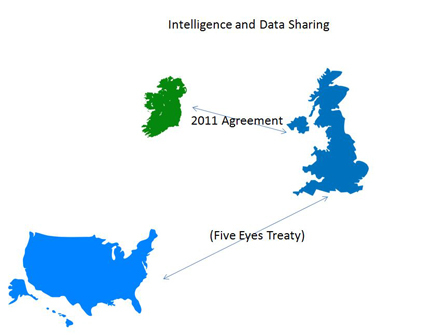 The US and the UK are connected by the "Five Eyes Treaty" and the UK and Ireland are connected by the 2011 Agreement. The amount and type of data that gets flushed through these connections is indeterminate; the various governments do not make that information public. Even if the agreements are not explicit in 2016, one must assume that future politics may forge new agreements which in turn will open up more national databases which in turn may reveal heretofore hidden parts of a person's history. So as a general rule where nations in the Western Hemisphere are concerned, it's best practices to assume that everybody knows everything or alternatively it's a matter of time before everybody knows everything. Consequently this site endorses the strategy of total transparency on the part of the applicant. You didn't ask that question specifically, but it's inherent in almost all 'does A know about B's refusal' type of questions. Do not disclose if you are refused. I tried to be honest with the British Embassy 19 years after I was bounced. I went for another visa even in Europe where I have permanent resident, but they gave me stupid excuse. It's better to lie and get what you want. Don't try to be honest, they aren't God. Not the answer you're looking for? Browse other questions tagged visas usa visa-refusals ireland or ask your own question. Applying for other visas after Canadian visa refusal?